Big O Tires Wicking Polo. 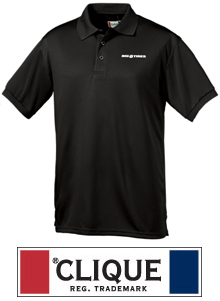 Clique performance polo in a poly-piqué mesh features a three-button placket with dyed-to-match buttons, knit collar and sleeve cuff, self fabric locker loop, side vents and moisture wicking finish. Fabric: 100% polyester; Weight: 5.3 oz; Left Chest Embroidery of Big O Tires logo on left chest.